Born and raised in Paxton Township, in what was then known as Lancaster county, John grew up on his father's farm in the growing British colonies. 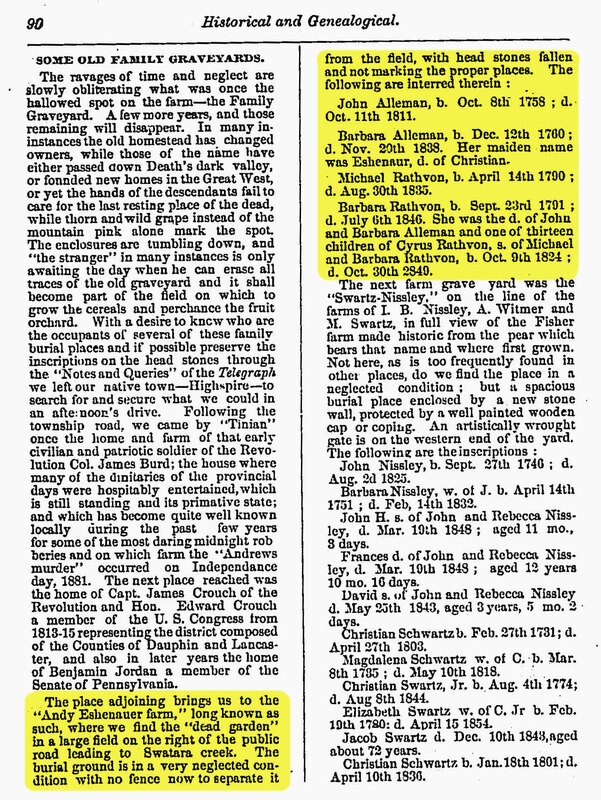 (The county of Dauphin was created in part from Lancaster Co. and included the area where the family lived, however, Dauphin County was not established until 4 March 1785, when John was 27. The township of Swatara, which John was known to be of, wasn't created itself until 1799, John was 41, and originally was a part of Paxton Township which later became Lower Paxton Township.) You will regularly see this written as Middletown, Pennsylvania as Middletown was the local village and where the family went to church and would eventually be laid to rest (this would be similar to saying your from the prominent town 3 miles down the road rather than the tiny suburb you actually live in). On roll call returned 25 Mar 1776. Captain Joseph Sherer's company of the 4th Battalion of Lancaster County Militia under Col. James Burd - Part of the New Jersey campaign in spring & summer. John is first private listed in the company. (Left with company for NJ in August where a number of the men in the company were wounded in a skirmish with a British cavalry near Amboy, New Jersey). --- June and July 25th are the only records of a skirmish to take place in 1776 at Amboy. Most of the action at Amboy was Mar-Apr 1777. 1777: John was on the books for the accounts of sub-lieutenant Joshua Elder as paying militia delinquency fines for the 4th battalion in 1777 (12 shillings, 6 pence). This roll (account No. 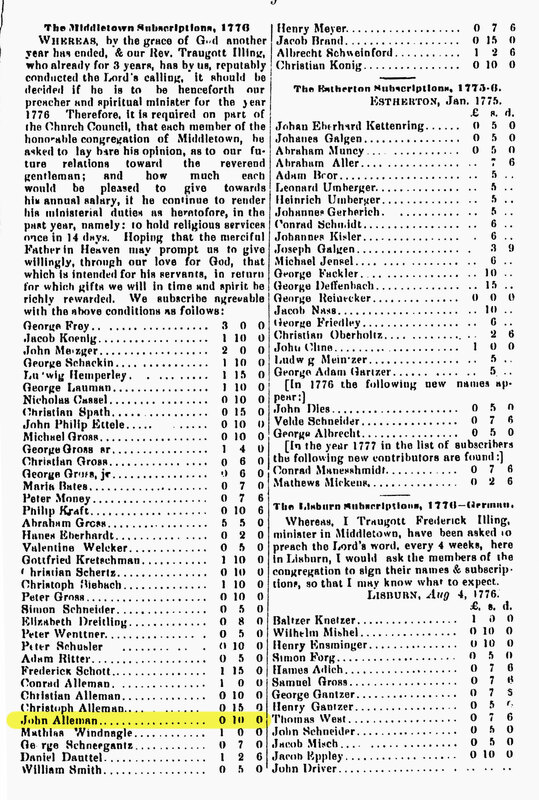 II) included many of his siblings and cousins, but was not divided among the classes (Stophel, Conrad, Christian, Henry Jr & Nicholas and neighbors Christopher & Jacob Roop). NOTE: Research into the original company Captain of the 4th Battalion, Joseph Sherer, and his son Samuel Sherer found father Joseph Sherer became ill while attending the Constitutional Convention at Philadelphia 15 Jul 1776 and returned home where he died Dec 1776, which would account for James Collier's later promotion. A family history also noted that Samuel was at Valley Forge but said no more. 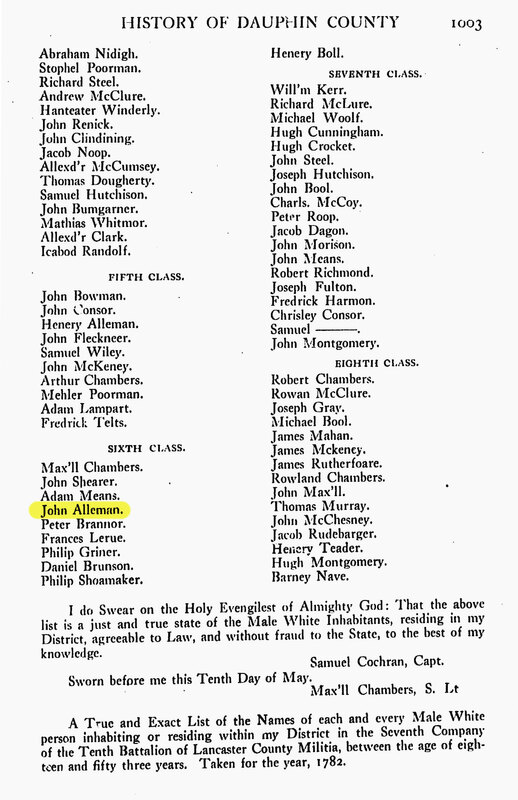 If he was at Valley Forge during Washington's winter 77-78, then John Alleman was also at Valley Forge since John and Samuel were proven to have served together under the same company in 1777-1779. 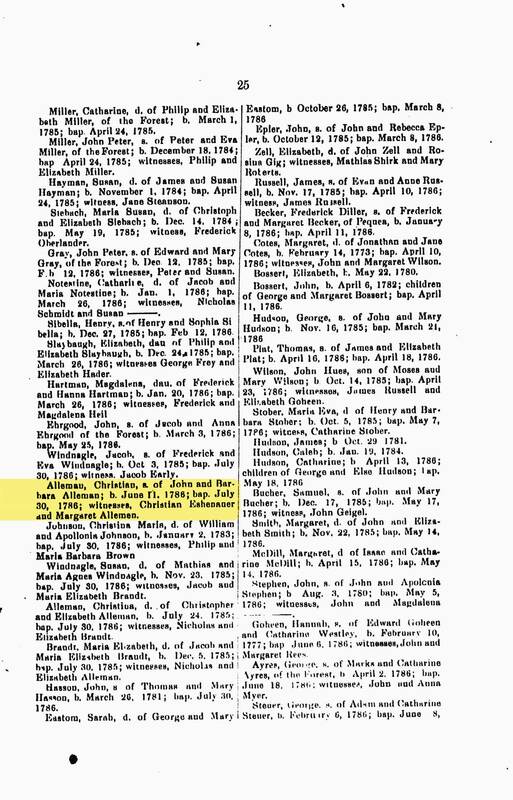 (Samuel Sherer even proves John's mother-in-law Margaret Eshenauer/Alleman's will in 1807). 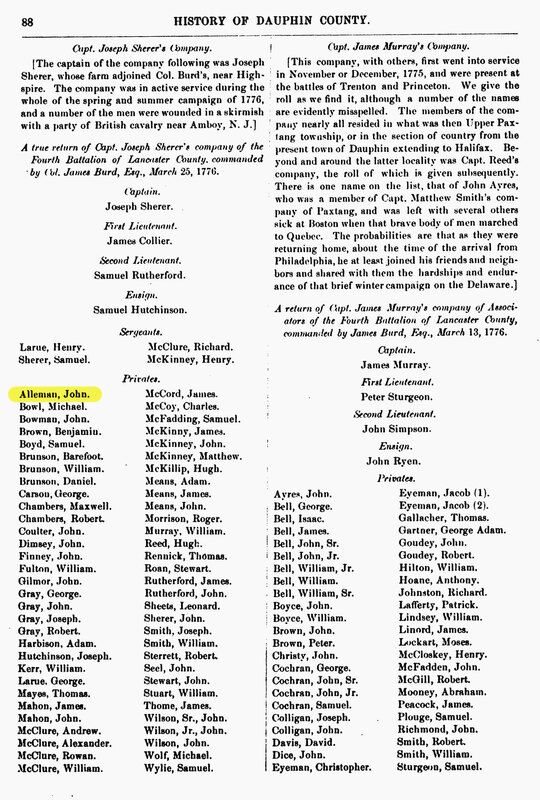 20 May 1779: John was on record as being in the militia under the command of Captain Henry McKinney of the 2nd Class of the 4th Battalion of the Lancaster County (Dauphin) Militia. John was again serving with his brothers and cousins and his Roop neighbors. 1780: John is down for land returns and land taxes in Paxton Township which included Middletown and "on the Swatara" along with Conrad, Stophel (Christopher) and Christian, and the Roops as well. 16 Apr 1781: John is on record as being under the command of Colonel Robert Elder of Captian Samuel Cochran's Company of the 10th Battalion of the Lancaster County Militia. (Again, along with Henry, Nicholas, Stophel, Conrad and the Roops). John was 6th class. 10 May 1782: John is recorded in the 6th Class of the 6th Company of the 10th Battalion of the Lancaster County Militia under Capt. Samuel Cochran (Again, along with Henry, Nicholas, Stophel, Conrad and the Roops). 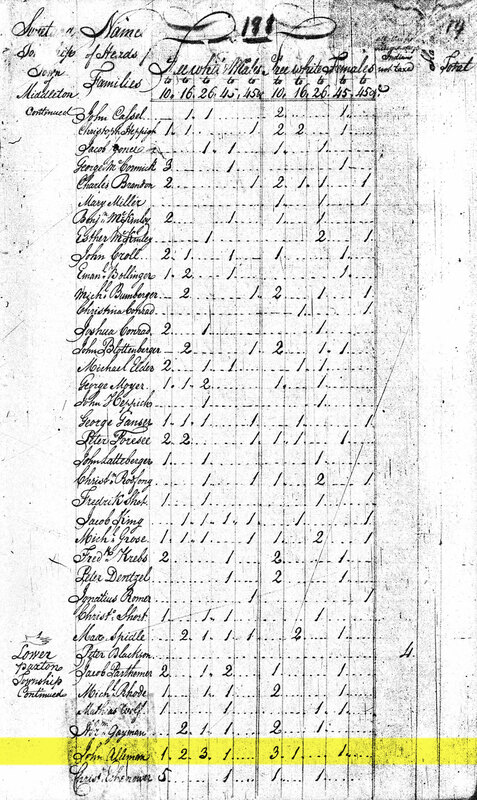 1800 Federal Census and Pennsylvania State Census in Swatara Township. 12 total members of the family are counted on the census. 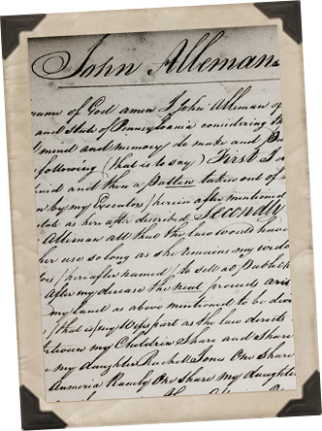 As a sign of his failing health, John wrote and sealed his last will and testament on 06 Jul 1809 in Swatara. 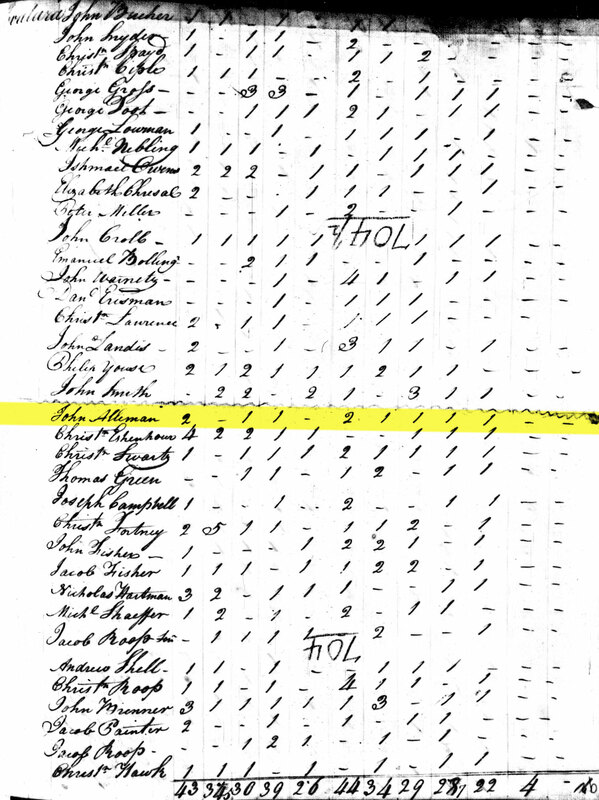 1810 Federal Census in Swatara Township. 10 total members of the family are counted on the census. 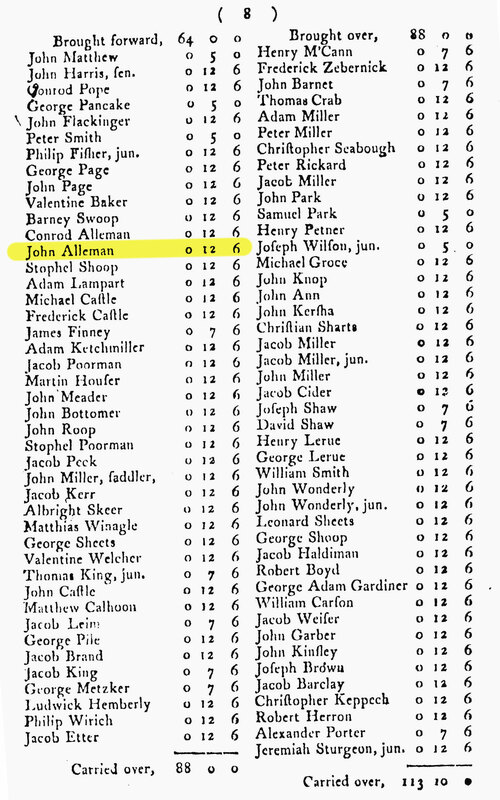 11 Oct 1811 is said to be John's date of death as marked on his headstone (not confirmed), other Alleman genealogy books list his death as 16 Oct. John's will was probated and proven in court on 21 Oct 1811. John and family were originally buried at "Andy Eshenauer Farm" in what is known as the "Dead Garden", in field along public road leading to Swatara Creek in Highspire. It appears the interred were removed from family graveyard and relocated to St. Peter's Church (the family church) in Middletown in 1900's. The American Revolution began in Massachusetts in early 1775 with the arrival of the British Army and Paul Revere's ride on 18 April. The war continued in the Colonies (Thirteen States) until 19 October 1781 when the British surrendered at Yorktown, Virginia. Naval conflict continued in the East and West Indies, mostly between the French and British until peace was agreed upon in the Treaty of Paris on 3 September 1783. 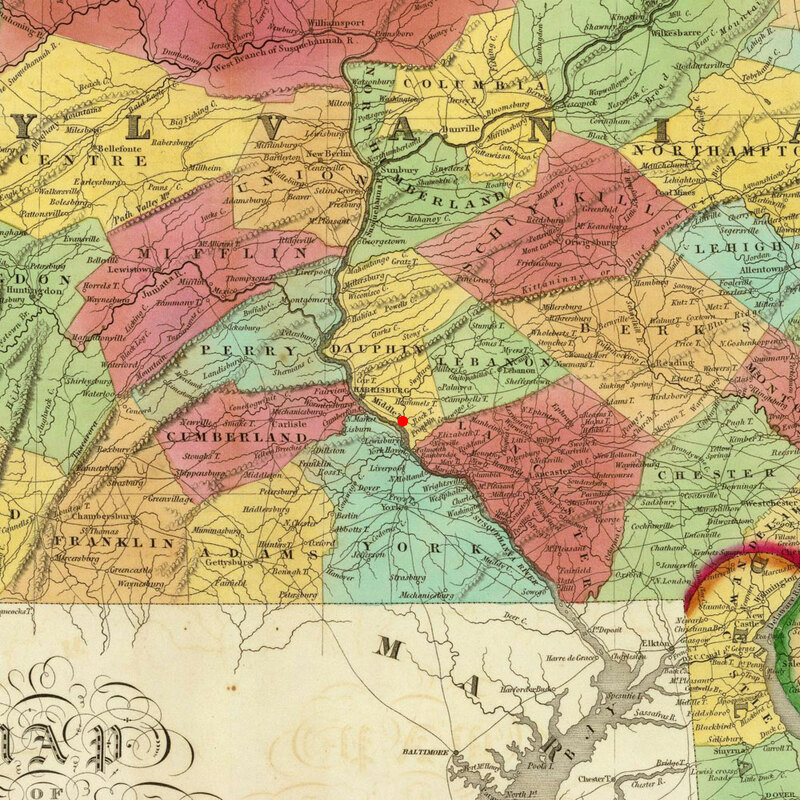 Dauphin County was formed in 1784 from what was part of Lancaster County at the time. Because of this, all of John's early information, including Revolutionary War Service records are all documented as being of Lancaster County. Some records and trees reference the family at a location known as Midlothian in Swatara Township, however, I again see no proof aside from possibly seeing it written on a single record. It's more likely this is an old spelling (possibly German spelling? ), misspelling, or some form of error related to Middletown, Pennsylvania. Middletown was the center of town, their main hub, where their church was located and ultimately where their final resting places would be. Other references to the family's location reference Swatara, Highspire, Paxton or Paxtang. First of all, what was originally Paxton Township is now known as Paxtang, Swatara did not originally exist as a Township but was Middletown "on the Swatara [Creek]" and never referenced as a location of residence (early on until its official formation as a township in 1799). Original documents will frequently state Paxton Township and then occasionally Highspire around the formation of Dauphin Township. All of these locations are grouped roughly half way between Harrisburg and Middletown. Roughly 6 miles east of Harrisburg and 3 miles from Middletown. I believe the family lived near the edge of Swatara, close to Highspire. Initially buried at the Eshenauer Family Farm's Cemetery in Swatara, the family was re-interred at Saint Peter's Church Cemetery in Middletown in the 1900's. This collective effort by the local government relocated many early American ancestors from countless small farm cemeteries in the New England area to localized public cemeteries. Reason being that upkeep on all the tiny family cemeteries had become impossible, leading them to become overgrown, fall into disrepair, and start to be forgotten. Almost all were on private lands/farms maintained by individuals who likely no longer shared any relation with those buried on their property. This relocation effort allowed for much easier management and hopefully prevented many of our revolutionary era heroes from being forgotten about and lost to time. UPDATE: Previously unknown, FindAGrave.com now has cemetery records for John & Barbara Alleman stating that the couple is buried at Ebenezer Cemetery in Middletown. Margaret Alleman, 1780 – ? 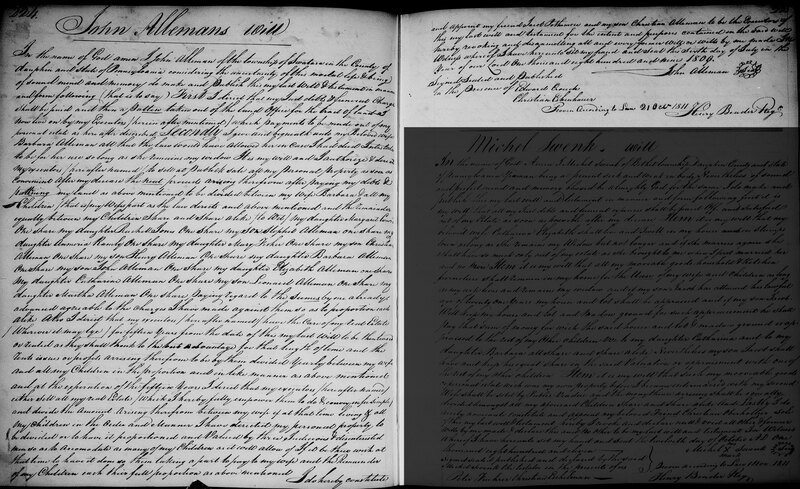 Elizabeth Alleman, 1795 – ? A The county of Dauphin didn't exist until 1785, when it was created (along with 5 other counties) from a massive Lancaster county that made up a large portion of the state. This change wasn't immediately adopted and some records were slow to change, which is why you may find some records stating Christian was from Middletown in Lancaster County. B Both the Heppick and Ettele names has been spelled many different ways in early documents and are still spelled differently, depending on who you ask. Heppick has been spelled Heppick, Happick, Happich, Heppich, Heppicht. Ettele has been spelled Ettele, Ettelin, Ettelien, Eteling, Ettley, Atley, Attlee, and Attle. C In 1825 the construction of the National Road (America's first highway) reached Ohio. This made the trek across Pennsylvania to Ohio much easier and saw a handful of Pennsylvania ancestors arrive in Ohio around this time. 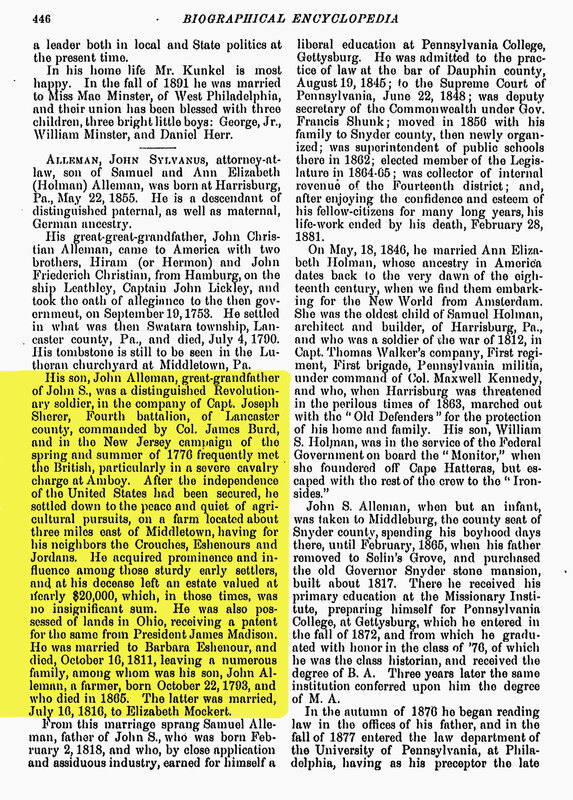 The Alleman's in particular arrived anywhere between 1826 and son Christian's marriage in 1833. 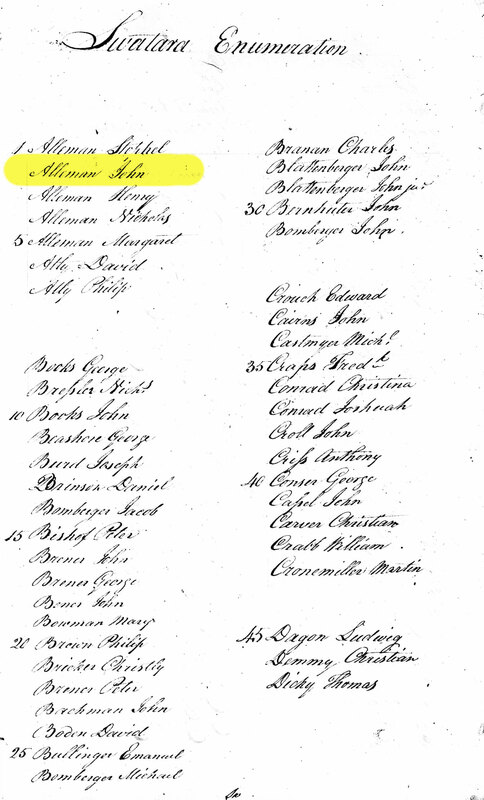 E 1777 - John is listed under the 4th Battalion Lancaster Co. as paying militia delinquency fines to Sub-lieutenant Joshua Elder on roll No. II and later in the year on roll No. III paying a hefty fine under the company of Captain Collier. Was it normal for revolutionary soliders / militia men to return home regularly to marry and continue having children while on active duty serving in the militia? John is counted as militia every year from 1776-1782, Meanwhile, he marries in 1777 and has children in 78, 79, 80, and 81... could this relate to his delinquency fines? 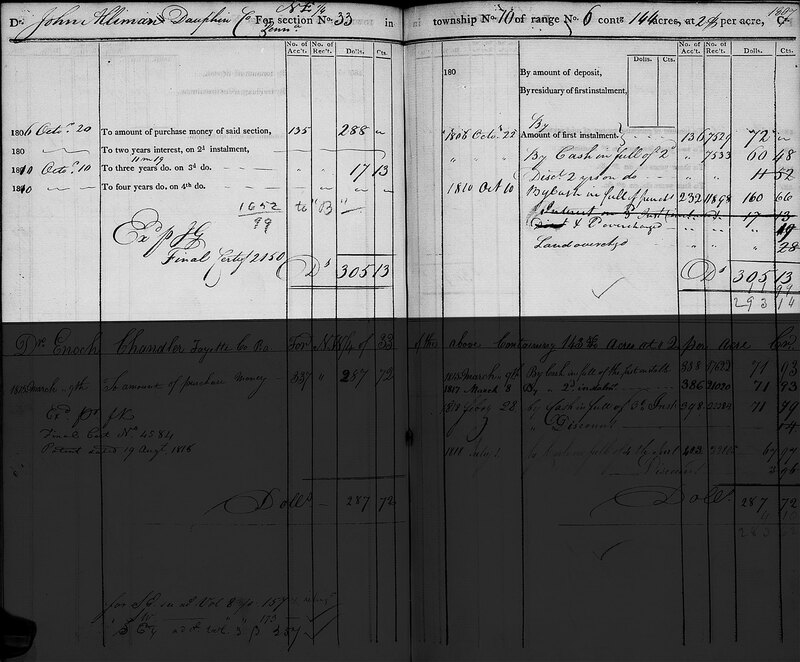 1 Family Data Collection - Individual Records about Christian Alleman; Birth year: 1786; Birth city: Midlothian; Birth state: PA; Edmund West, comp.. Family Data Collection - Individual Records [database on-line]. Provo, UT, USA: Ancestry.com Operations Inc, 2000.